Interacting with elephants may be the most sought after tourism activity in Thailand, and we were no exception to wanting to get up close and personal with them. Jeremy and I spent a full day with four sweet elephants outside of Chiang Mai. 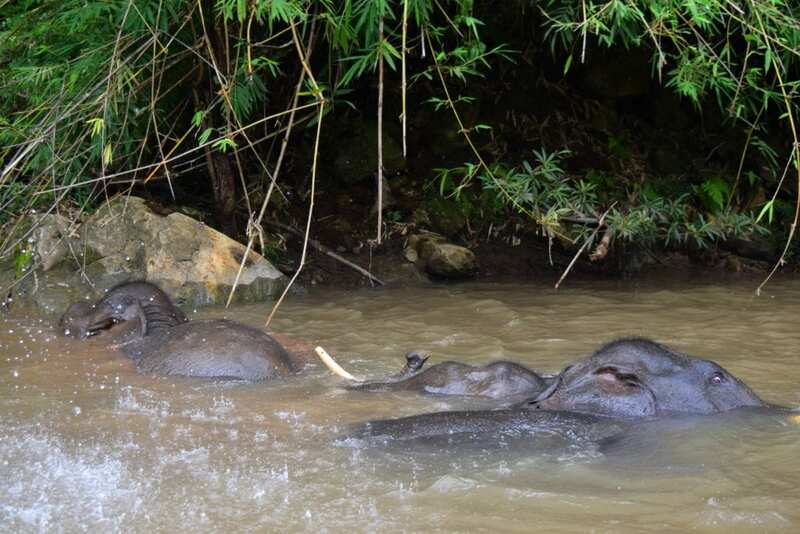 We didn’t ride them (and there’s no need for me to rehash why, there are tons of articles on the subject), but we did feed the elephants, walk with them through the jungle, hug them, pet them, give them a “mud spa”, and play with them while they bathed in the river. It was magical. It was incredible. Through a combination of luck of the draw, traveling in the wet season, and choosing a location that tended to have small group sizes, Jeremy and I ended up on a private tour: just us, four elephants, and five guides. We found the elephants that we were lucky enough to spend time with incredibly adorable, a little more intimidating than my animal-lover self anticipated, and wickedly smart. The elephants consisted of two mothers who each had a 7-8 year old son–and oh my, was it ever easy to tell apart the rambunctious boys from the more steady, adult mothers. Their four personalities were distinct and fascinating. The day could not have gone better, and we had a very positive experience that we will never forget. Unfortunately, not everyone is as lucky with their elephant visit. 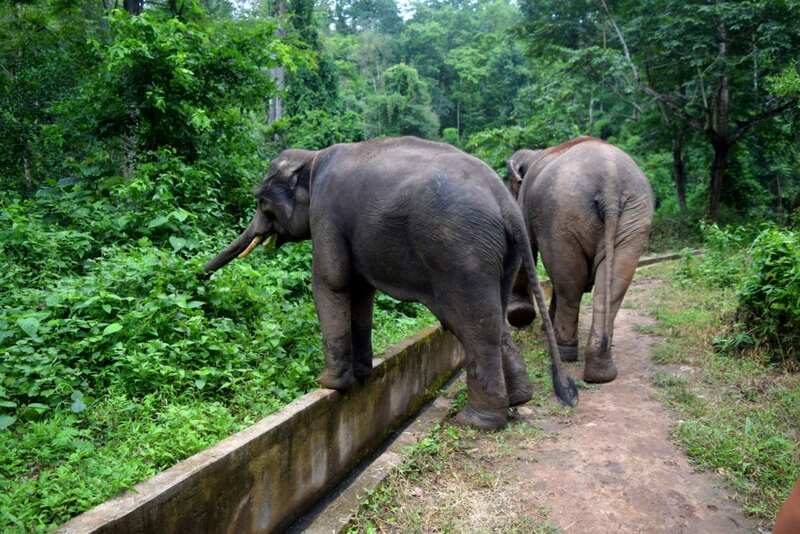 Before going to Thailand, we heard horror stories of chained and depressed elephants, locations that advertised “no riding” but actually did have tourists ride their elephants, and unethical sales practices. 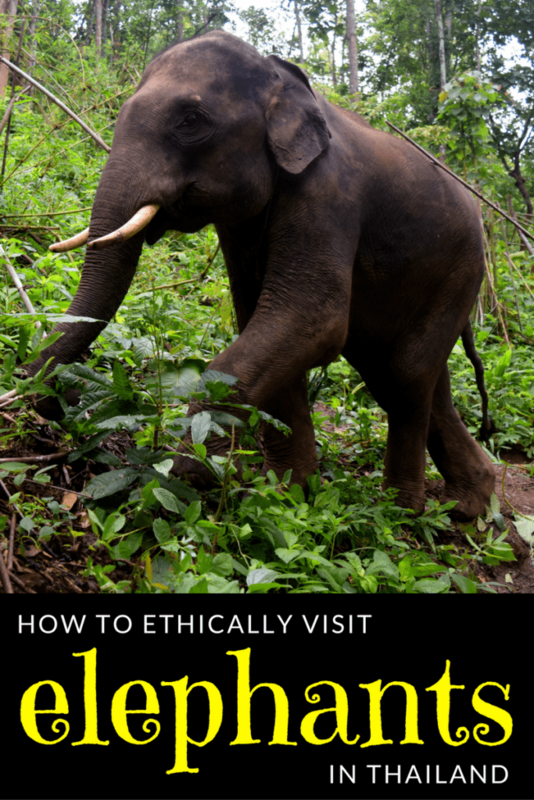 When it comes to elephant tourism, Thailand has the good, the bad, and the ugly–here’s what we learned, and how to ensure that you also have a spectacular visit. 1. Think beyond the Elephant Nature Park. Before arriving in Chiang Mai, I was under the impression that the well-known Elephant Nature Park was the place to see elephants in Thailand. I’m sure that it is a wonderful place, based on rave reviews from everyone who goes there. It also requires planning ahead–it was booked up more than a week out for one day experiences when we went to Chiang Mai, even though it was the wet season! Given the interest that Thailand’s tourists have in elephants, though, (and the money that they are willing to spend), it’s no surprise that there were offices for elephant parks and sanctuaries on every corner in Chiang Mai, and slick brochures with dozens of company names in every tourism office. There are options! 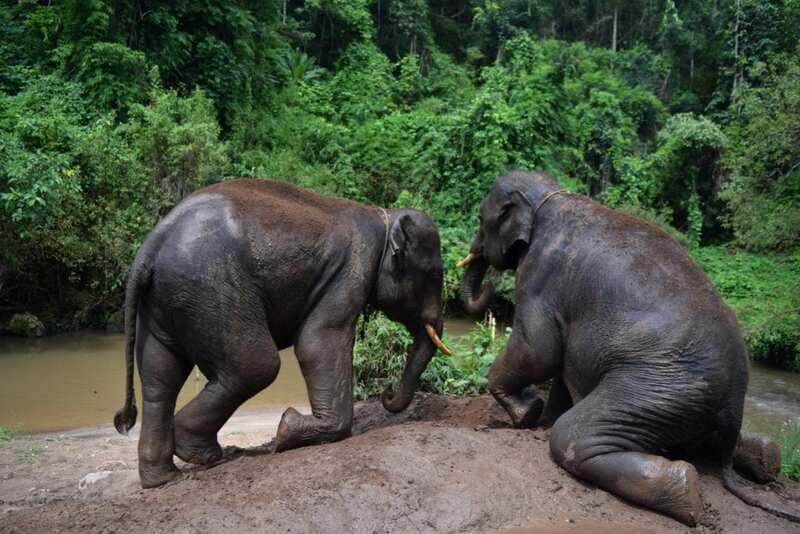 Some options are better than others, but with research, there’s no reason to give up on interacting with elephants if you don’t reserve a spot in advance at the Elephant Nature Park. Jeremy and I picked up pamphlets for several elephant tourism companies that advertised “no riding” tours… and then Googled them. Some had great reviews, some had very few reviews, and some had bad reviews. We nixed several places after learning that their elephants were available for riding despite advertising the opposite, or that the elephants appeared to be chained for most of the day. 3. Don’t rely on the tourism offices to be honest about what they’re selling. When overwhelmed with choice, Jeremy and I approached one of the tourism offices in Chiang Mai and told the woman working there what we were looking for. We showed her a company that we’d like to work with, and asked if she could help us contact them. The high pressure sales tactics began immediately–the woman called someone on the phone from a different elephant company, and tried to get us to set an appointment with them. Uncomfortable, we asked about the program–it was riding, exactly what we said we didn’t want to do for ethical reasons. We skedaddled after that, completely uncomfortable with the entire interaction. 4. Don’t feel pressured to find an elephant sanctuary or company in advance. Many of the smaller outfits we looked into didn’t have a website, or even an email! While I expect that there are new websites and pre-booking options popping up every day, there are many small elephant businesses that are still accessible only on the ground in Thailand. 5. Consider making an elephant experience a priority while in Chiang Mai. If you want to interact with elephants during your trip to southeast Asia, Chiang Mai is arguably the best place to do it. It has a huge concentration of elephant businesses to choose from, and is the only place we saw during our trip to southeast Asia that advertised plenty of “no riding” options. 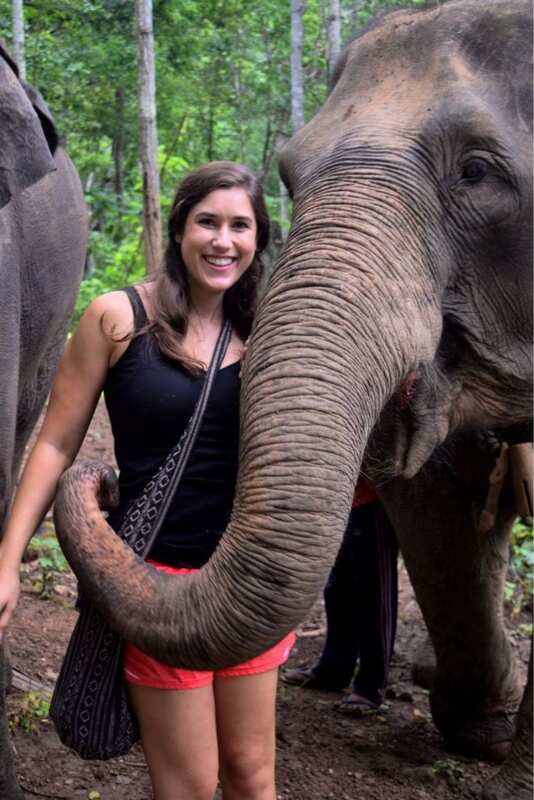 Western tourist’s newfound ethics regarding elephant riding have changed the business model in Chiang Mai, but in Laos and Cambodia, elephant rides are still the expected and typical way to interact with elephants–we didn’t see a single business in either of those countries that offered only “no riding” experiences. 6. Know that there is no guarantee. When interacting with animals–especially exotic, privately owned animals in the developing world–the risk that the animal is being mistreated to access your money is always present, no matter how smooth the sales pitch or nice the facility. Do I feel reasonably confident that the company we chose treated their elephants well? Yes, I do–there were no chains that we saw, no spears, no violence administered, and the elephants were bright eyed, playful and appeared to be happy and healthy. On the other hand, the animals approached us from the jungle, brought by their mahouts. We never saw where they lived or slept, or what their lives were like at night when the tourists went home, and the more anxious part of my mind can’t help but wonder if there’s a reason for that. Taking the mitigated risk that we would be contributing to mistreatment was one that we deemed worth it, but I would be lying if I said that I didn’t feel a little bit uncertain about our choice to see the elephants at all–it certainly enriched our lives, but I doubt the elephants got much out of the day (other than a bunch of bamboo and a bath, but they could have had that without the gawking bipeds). The ethics of animal interactions are a long, complicated subject for another day, but many of my thoughts can be summed up in this awesome post from Alex in Wanderland about the desire of animal lovers to balance interacting with the creatures they love, while avoiding damaging or endangering the creatures themselves. Overall, we had a blast with the elephants. 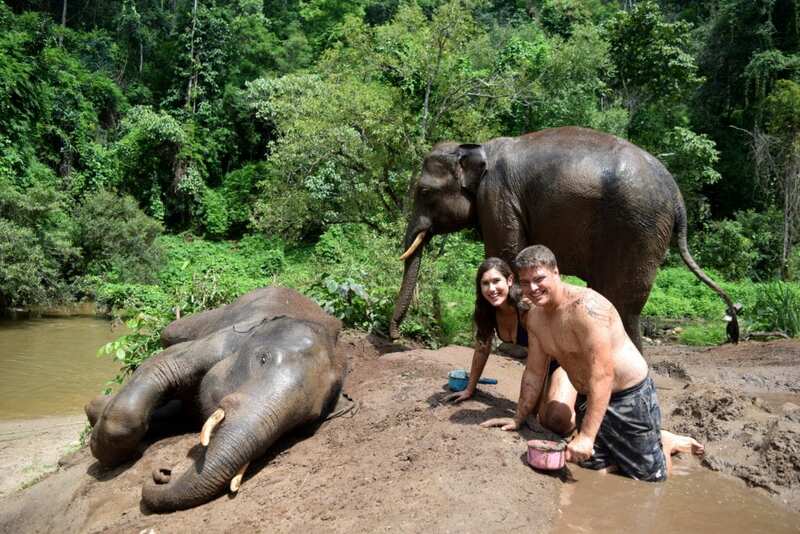 The experience is easily in the top five from our trip, the absolute highlight of our time in Chiang Mai, and I will cherish the memories of hugging sweet elephants and watching them do ridiculous things like making mud slides into the river forever. 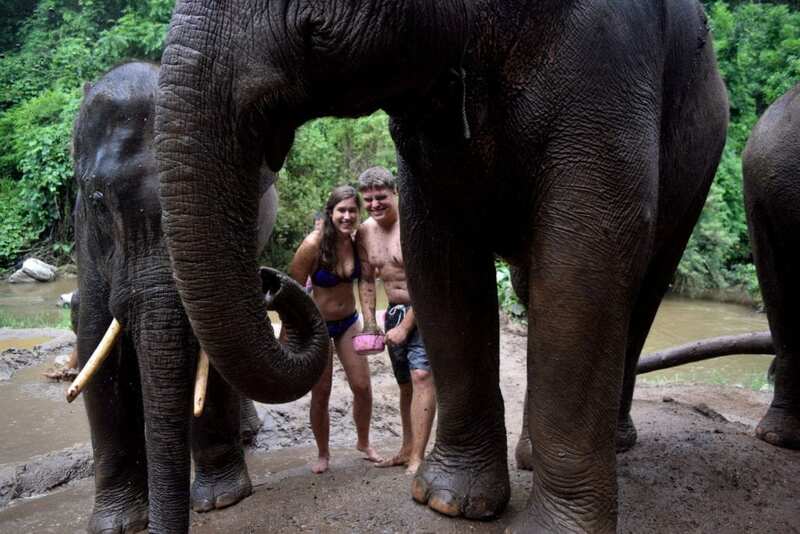 The listed going rate for a one day elephant experience appeared to be between 2000-3000 baht per person, or roughly $60-85. As almost always in Southeast Asia, prices are negotiable. Hug Elephant Sanctuary — Be prepared for an hour-long drive from Chiang Mai while riding in the back of a pickup truck on a freeway (likely the most dangerous thing we did in Southeast Asia). What’s waiting at the end is pretty spectacular! Hug Elephant Sanctuary offers haf day and one day experiences, as well as one week volunteer trips. 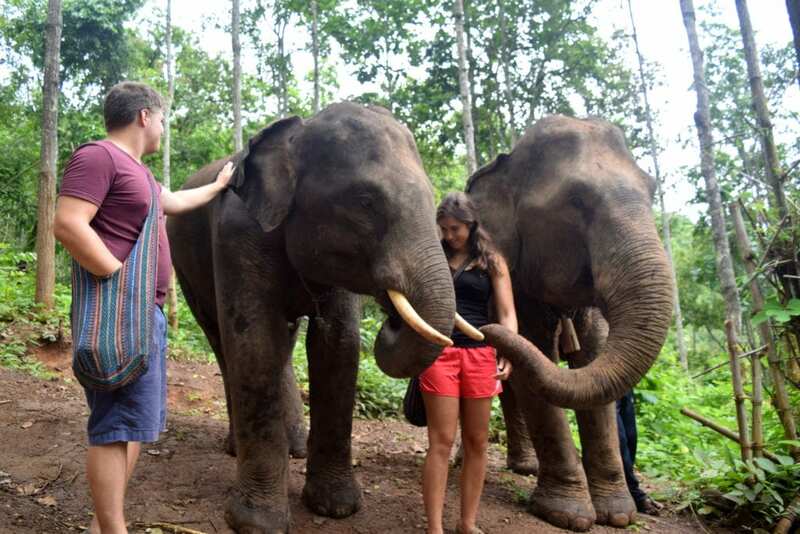 We opted for the one day experience and were fully satisfied with the several hours that we spent with the elephants, the delicious lunch that the sanctuary served, and the attachment that that mahouts had to the elephants–their love for their big friends was abundantly clear. Thanks for writing about this! It really does help generate awareness. It’s also good to hear that things seem to be moving towards no-riding in thailand. I was appalled by the mahut-courses being offered in Laos personally. I just hope that in Thailand the treatment of the elephants is improving behind the scenes too. And at those prices, it’s easy to see why elephant tourism is so important to the locals; my concern about any elephant interractions is are we contributing to increasing the number of animals in captivity. Like you say it can be really difficult to work out who the good guys are, so thanks for writing this. I was definitely pleasantly surprised by how many no-riding options were available in Chiang Mai–but, since Thailand was our first stop, it left me even more uncomfortable with the state of things in Laos and Cambodia. I definitely agree that it’s hard to know who the good guys are, or even if you can count us elephant-gawking tourists among them. The subject is enormously complex when looked at from all angles! Hi Kate – Just want to say I love your site and its design and your writing. I’m going to start traveling soon and blog about it, but since I’m an ecologist, I’d like to focus on sustainable travel. I know there are other travelers looking for this type of experience. If I create a Sustainable Travel board on Pinterest, I hope you’ll accept my invitation. Have fun and keep up the great work.